I am sending you this e-mail because there a lot of things I need to say and I want to make sure I say them without interruption and crying. I have been avoiding your calls and for that I apologize. 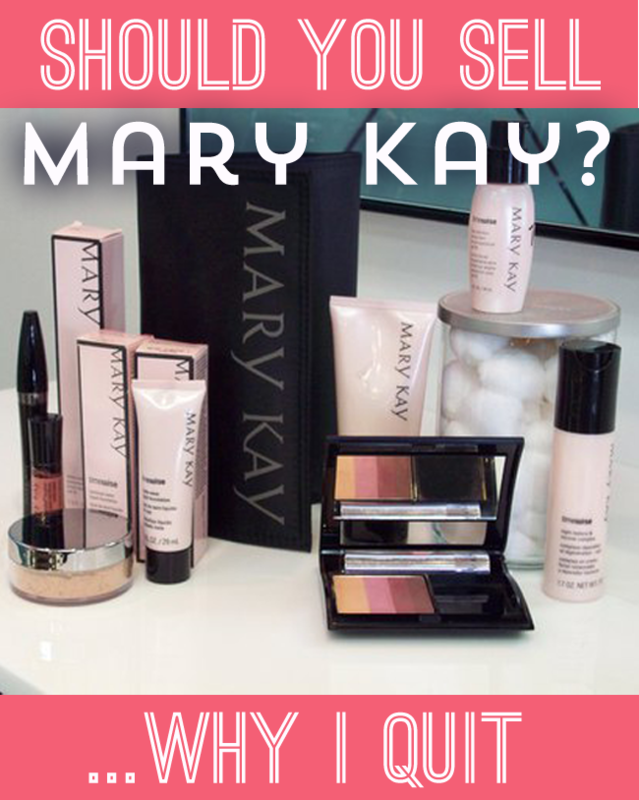 I want to let you know first that I am done with Mary Kay. I want to be open and honest with you about why I have decided to walk away completely. Over the past three and half years in this business I have done things that I am not proud of. I have lied about my status to cover for missing goals. I have lied to people about how much money I have made in Mary Kay, always using the highest amount, not averaging the actual amount between my 3 or 4 top classes and the ones where no one showed up. I have bothered so many unsuspecting women to have a facial or hold a party, who clearly did not want to, but I was still politely persistent. I can actually admit that I ruined some of my friendships because of my persistence. In doing this a wedge was created between myself and the women at my church. You see I was so focused on my MK business all the time that it pushed the people I wanted to be around away. I thought they were rude for not wanting to become my customers and in reality they were just trying to avoid the pushy MK lady. After all it is a church and my only reason for being there should have been to connect with people of God and build my relationship with Him. Thank God they are Christian women who will accept me back into their family with open arms and no judgment. I have come close to ruining 2 of my very close friendships with wonderful women who I have known since we were kids. I am so grateful to them for being true friends and being patient with me. I could not be going through this without their support. While I was working so very hard to make it happen with my MK business,not only did I compromise outside relationships but I sacrificed my family as well. My son was only 3 months old when I decided to become a director and I was not there 100% for him as an infant because my mind was so driven by Mk. I missed a good year and half of his life and that I regret. that is time I will never get back. Milestones I could not really enjoy because I was so stressed out from Mk. It is important for me to spend as much time with my young children now while I can mold their young minds and actions. The example I have set over the past 3 years is not the one I want my children to follow. I want to be an honest, loving, confident, strong and happy woman so my daughter will have an excellent example to follow as she grows up. I was not setting this example. I was always stressed out and frustrated because someone cancelled their appointment or fell through. I was always telling my children to be quiet or stop that because I was making phone calls. Even though no one ever answered the call or called me back, now I know why. I was home but never really there emotionally or mentally for my children and that I regret. I started MK because I wanted to be the stay at home mom who had play dates, went to library outings, and took picnics to the park. I never did those things because I knew I would try to recruit the entire room just so I could meet production, it drove me crazy. This brings me to the most devastating part of this entire event. My marriage. My relationship with the most important person, who I vowed to love, honor, and cherish in the eyes of God, has been crushed by my lies and deceit. I was not only lying to my husband about my business but digging us deeper into debt too. I was so obsessed with trying to make the $1000 bonuses that I was using our families finances to reach my goals. You see I never held enough selling appointments to make the money to actually gain a profit or place orders. My appointments never held and it was hell trying to book enough in the first place. This stress caused me to shut down and do things that were wrong. I used my husbands credit cards to cover production several times without telling him. I used $2000 from my very first commission check to accomplish a stupid “goal.” I really wanted to get on stage and get my bee pin. But I did not have the prospects so I signed up some family members and wasted my hard earned money for a stupid pin. Oh I know that I had some really great commission checks but now I realize it was all at my recruit’s expense. She is now thousands of dollars in debt as well because she wanted to make it happen too. I was stealing money from my children’s bank to pay my credit card bills that I racked up because I thought “oh it’ll come back in next month’s commission check.” Well it never came and I feel horrible. I finally sat down with my husband and told him everything. How I used his card to finish honor roll for a $1,000 bonus. I put over $2,000 on his card that month. So that production was fake. Most of my monthly production every month was fake. My car was fake. I have been making payments on it for over 4 months now, that’s over $1,200 that should have been put back towards my family. Now I have to explain to my four year old daughter that we have give back our MK car. I have to explain to others what happened. Luckily we do have another car, but we need to fix it and since I have maxed out our cards and spent any extra money we had, we have to borrow money from family. After finding out everything I did for my Mk business my husband was furious. He stated the obvious, “I thought Mk was supposed to make us money, not get us deeper into debt.” That is pretty much how every one I know has responded when I tell them the truth of what was going on. We almost got a divorce because of all this crap and the option is still not off the table for him. My husband, my best friend does not trust me anymore and now my children have to suffer through a rift between their parents. This was supposed to make my life better not demolish it. I refuse to let this mistake ruin my family and my marriage any more. I take full responsibility for my actions and as part of making things right I am walking away completely. I have called product repurchase and I am able to send back $15,000 retail. That’s about 2/3 of the amount I have squandered in my MK business this year. I need to get this money back because it is not mine and I need to decrease our debt, so we can move forward. This is my decision to save my family. As far as letting anyone down, it is not my responsibility to help those women. They had a year of my life and never took me up on it. They have other people they can get support from. I have left it so that they can attend my former director’s meeting, not that they go anyway. They have other directors who can lead them and train them. I have talked with my close friends I recruited into MK about all of this. They know everything. I felt that they deserved to know what was really going on and why I decided to walk away completely. They all understand and respect my decision. They still all want to sell at their own pace and build their customer base as they should. As for everyone else I really don’t know I wish them the best in their lives. They know I am their for them as a friend if they need advice or instruction. I feel very confident in my decision and I am ready to leave this behind me. I am not writing this experience off completely. There were many great times at events where I learned many skills. I have learned a very important life lesson about being honest and trustworthy. I have realized and accepted to be happy with I have because it can be taken away in a blink of an eye. I have come closer to God. I want to thank you for your effort to help me but this is not what I want to do any more. I hope you can respect my decision to quit my job with Mary Kay. It’s a chapter of my life I am ready close.I do not like the person I have become. It’s not who I am. It’s not who God intended me to be. So glad I never made it to director. I sensed intuitively from the few I recruited that this whole thing was BS. Debt upon debt because the market is super saturated. Families ruined with lies and deceit. ugh I hate that this company still exists. I hate that there is absolutely no where to advertise. I hate that women for decades have avoided the MK scam like the plague. I hate the constant changing of products by a company that profits on ruining hundreds of women. I just found this website a month or so ago as I await my 90% refund for returned product. I came to my decision to leave after my Mom passed away suddenly. I no longer went to meetings and engaged with my unit. I had too many other things to take care of. It’s almost like my Mom had guided me out of the pink fog and realized I needed to get out while I still had my finances in tact. I no longer spend my evenings and weekends endlessly contacting perspective clients. I can enjoy my time with my young children. Needless to say my director is not happy but I had to do what it right for my family. And this was the best decision I have made in a long time! Glad to bee out! Such a good feeling, isn’t it? Enjoy your freedom!